In the absence of cost-effective, large-scale electricity storage, reliability of the nation’s electric power system requires that electricity be available to meet consumption at any moment. NERC, a nonprofit corporation that oversees regional electric reliability entities in the Lower 48 United States, Canada, and parts of Mexico, publishes a summer reliability report that presents peak electricity demand and supply changes and highlights any unique regional challenges or expected conditions that might affect the bulk power system. An important metric of electric reliability is the anticipated reserve margin, measured as anticipated resources (capacity) minus net internal demand, expressed as a percentage of net internal demand. Net internal demand reflects the total internal demand minus demand response systems that are expected to be available during a peak demand hour. A reserve margin of 15% means that about 15% of a region’s electric generating capacity would be available as a buffer to meet the summer’s peak hourly load in case of unforeseen generation or transmission outages. Planning Reference margins, which differ by region, are reserve margin targets based on each area's load, generation capacity, and transmission characteristics. In some cases, the planning reference margin level is a requirement implemented by states, provinces, independent system operators, or other regulatory bodies. Reliability entities in each region aim to have their anticipated reserve margins surpass their planning reference margins, which are generally set near 15% in most regions. Note: ISO is independent system operator. All U.S. regions in NERC’s Summer Reliability Assessment have anticipated reserve margins that are higher than their planning reference margins with the exception of ERCOT. With 78,146 megawatts (MW) of anticipated resources this summer, ERCOT projects an anticipated reserve margin of 10.9%, which equates to a capacity shortfall of about 2,000 MW, based on its planning reference margin of 13.75%. Anticipated reserve margins are highest in the PJM and Southwest Power Pool (SPP), where reserve margins exceed 32%. Reserve margins that are significantly in excess of target levels, although helpful for reliability, indicate the region may have an excess generation capacity. Demand response resources play an important role in electric reliability. Demand response involves the targeted reduction of electricity use during times of high demand when resources are limited. For example, contracts between utilities and customers may allow power system operators to temporarily turn off some air conditioning equipment or industrial processes during demand response events. In return, customers receive incentives for these reductions. 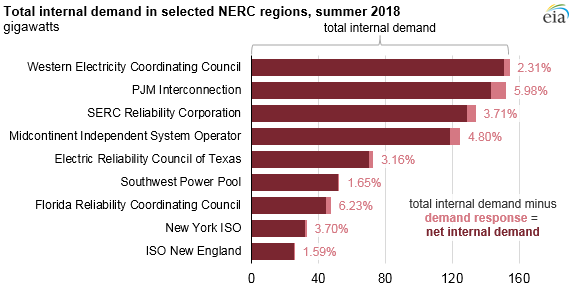 Based on data compiled by NERC, demand response resources range from 6% of total internal demand in areas such as the PJM Interconnection and Florida Reliability Coordinating Council to less than 2% in ISO New England and SPP. More information about regional summer reliability issues is available in NERC’s 2018 Summer Reliability Assessment.